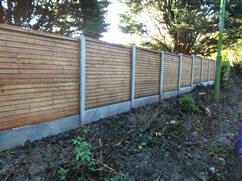 Slotted Concrete Posts are an ideal long term solution to putting up a panel fence. Concrete posts can remain in the ground for years, even decades longer than a conventional timber post as they are not as susceptible to decay in the same way as a timber post. Concrete gravelboards are always in 6ft (1830mm) long sections, available in 6” and 12” (150mm and 300mm) height to suit standard UK panel widths. 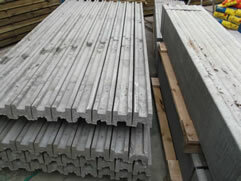 The choice of whether to use concrete posts comapared to timber posts is a personal preference. Cost and appearance are often the governing factors, as some people prefer the more natural look of a timber post at a less expensive initial cost when compared to a more expensive concrete post. WCFS stock as standard, Redwood Timber Posts, Which are far more suited to ground contact than Whitewood / Spruce posts, Which sometimes only last 2-3 years.